EcoSox / Blue Flame / JAG Athletic products are guaranteed for one (1) full year from date of purchase except for compression socks which are guaranteed for six (6) month. Either return your laundered socks with an explanation of defect or email us pictures of any defects or premature wear and we will replace the product. Contact us at sales@ecosox.com with name, address, the shoe size of the individual wearing socks, and receipt or order number. 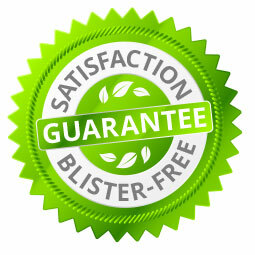 Products marked with the "Blister Free Guarantee" seal are made with yarn that is so good at naturally removing moisture and friction caused by moisture that we can put a guarantee that marked products will not contribute to the formation of foot blisters. If you believe your product packaged/marked with the seal contributed to the formation of a blister, your product can be returned for a replacement pair. Contact us at sales@ecosox.com with name, address, the shoe size of the individual wearing socks. DISCLAIMER - Wearing products marked with the Blister Free Guarantee will not prevent blisters from forming due to reasons unrelated to fit and friction of wearing socks.